Many of us living with chronic illness are employed full time despite our health challenges. Pulling on our pantyhose hose and deciding to get through another workday when we don’t feel well takes determination and planning. 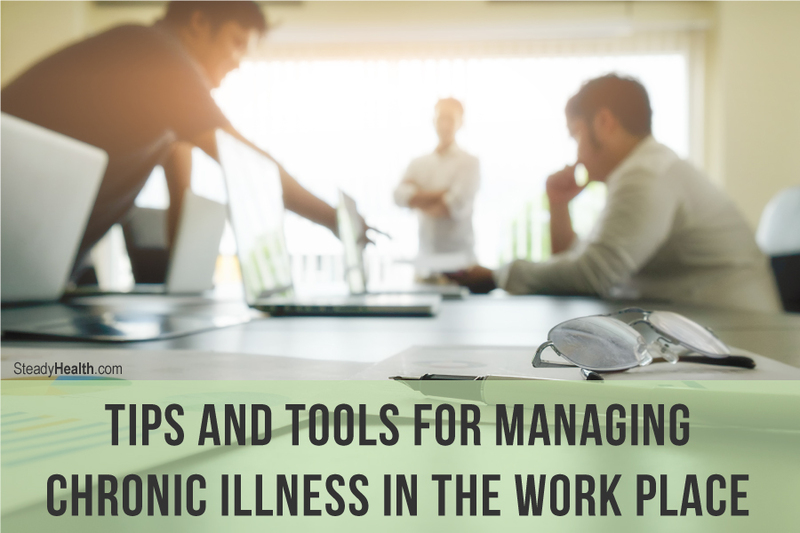 Here are some simple tips and tools for being successful in the work place when we live with demanding health issues. Practice wellness in order to support your body’s strengths. Eat nutritiously, get a good night’s sleep, drink alcohol in moderation, exercise sensibly, hydrate, wash your hands often and keep them away from your face, and meditate or practice quiet, slow breathing. Do everything in your power to maximize your health on a daily basis. Once at work, prioritize. Don’t procrastinate. Many of us living with chronic illness are unsure how we’ll feel from day to day or even hour-to-hour. You don’t want to leave your big project until the last minute, which might be due on a day you feel ill and can barely see straight. If you prioritize, you can avoid this scenario. Make lists, either in your head, on your computer, or on paper. I make a list every day. Then I prioritize tasks that need to be finished immediately, jobs it might be wise to complete, and lastly work that can wait. This helps me keep the work flowing. With a chronic illness that can flare without warning, I have to keep up with my workload and get tasks done early whenever possible. Even without chronic illness, the workplace is often stressful. This stress is magnified when we live with illness. I’m inclined to rush when I feel pressured at work. However, when the impulse to rush occurs, I force myself to slow down. Rushing is bad for my health, leads to errors, wastes time, and increases the very stress I’m trying to avoid. Employees are entitled to take breaks and lunch in every work environment, per US federal law. No matter how busy a day, we need to take those breaks in order to give our bodies and minds an opportunity to rest. Ultimately this helps us get through the workday, even though it may feel as though it slows us down. Similarly, we need to stop work to eat a healthy lunch. We require good nutritional support as we go through the day, no matter how hectic it might be. And don’t be tempted to multitask while you eat! Use your lunchtime as an opportunity to recharge. On your breaks, try to find a quiet place to escape to where you’ll have privacy and your office phone won’t ring. Almost every workplace has a break room or lounge for its employees. If the place is private enough, consider meditating, or simply shut your eyes for a few minutes to reduce stimulation and give your system a chance to rest. In addition, we need to get up and move, if we can, every hour or so. I have the bladder of a frail eighty-year-old, so I’m out of my chair and my office hourly to go to the restroom. In addition, I find reasons to deliver information in person instead of making a call or emailing it. If I feel unwell, I walk slowly, but I still move. This always rejuvenates me. If the weather is temperate, leave your building and enjoy the fresh air and sunshine. Even a ten-minute dose of sun and air can be surprisingly reviving. Remaining employed when we often don’t feel well is challenging. It requires constant mindfulness. But with determination and planning, many of us can maintain our careers and thrive in the work place. What are the benefits of relaxation techniques?